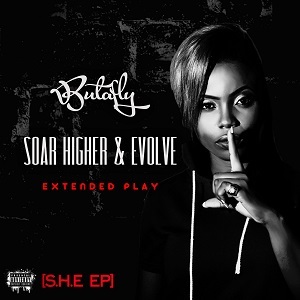 Nigerian rap sensation Butafly is out with her sophomore body of work titled 'Soar Higher & Evolve Extended Play (S.H.E EP) , this comes just few weeks after the release of her widely accepted 'Runnin' Thru Gidi' (Drake's 'Know Yourself' cover) track. On the S.H.E EP, Butafly confidently displays her flexibility as she takes on Hip-hop's trending trap sound. The six-track solo project which can be fittingly described as a compilation of cover versions exposes her versatility to her ever growing number of fans as she treats them to good musical vibes. Although three songs off the project were released as individual tracks, S.H.E EP is a total experience. Each track is unique and tells a different story; from the infectious Flawless tune to the conscious tune, Alright, through to the melodious tune, Jersey, next, the motivational record, Mama I Made it down to the feel good Queen Elizabeth track which is an M.I Abaga cover and finally the Drake Inspired 'Runnin Thru Gidi' tune. As she did with her debut project - ButaflyRap Trap (BRT) Mixtape, Butafly will once more stamp her feet as one of the most promising Nigerian female rappers. The ardent rapper is currently working on various singles scheduled to be released soon.